The Office for National Statistics has recently released the birth figures for 2015 which show that women over 40 are having more babies than the under 20s for the first time in nearly 70 years. 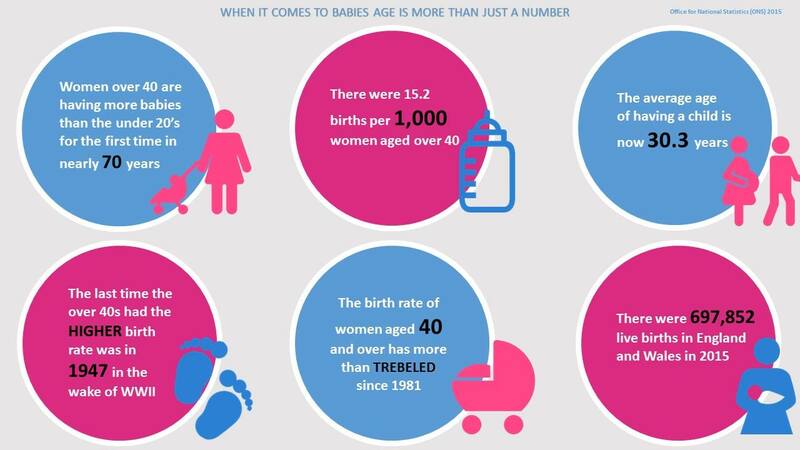 The statistics make for an interesting read and reinforce the common perception that the face of parenthood is changing in the UK. There is no denying that the age in which women are having their first baby has and continues to rise due to a variety of reasons – these include women wanting to pursue careers, educational opportunities, as well as the high cost of housing and other complex social issues. It is unlikely that this trend of delaying parenthood is going to change anytime soon. However, the reality is that a woman’s fertility starts to decline from early to mid-30s depending on ethnicity so is there anything else we can do to support this trend? “There are undeniably some very complex and valued reasons why women are delaying starting a family. However, the harsh reality is that both women and men’s fertility starts to decline in their 30s. Later in life, it can also take a couple longer to conceive and there is a greater risk of miscarriage and risk of genetic abnormalities such as Down’s syndrome, as well as an increased risk of complications during both pregnancy and labour with age. If there are any underlying fertility issues it’s easy to run out of options in your late 30s early 40s. I believe that as a society we need to face the reality of delaying parenthood. We should discuss the issue openly and both women and men should be encouraged to undergo fertility checks in the same way as they do other health screenings. Knowledge and education is key! If parenthood isn’t an option until a person’s late 30s/early 40s then why not consider egg or sperm freezing to increase the chance of having your own ‘genetic’ child at a later stage in life. Many patients of mine are devastated to hear that their only chance of having a child could be by using an egg from a younger ‘healthier donor’ – if only I had had the chance to talk to them about the issue 10 years earlier.